All candidates running in the ridings of Airdrie-East and Airdrie-Cochrane have been invited to participate and have confirmed they will be attending. The goal of the forum is to encourage public dialogue and awareness of the priorities of Alberta business. 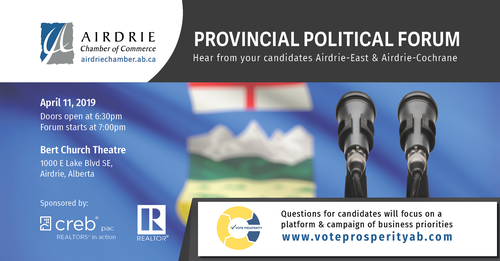 Questions for candidates will address issues outlined in Vote Prosperity, the Alberta Chambers of Commerce (ACC) platform of business priorities for the next Alberta government. Please note that there will also be an opportunity for the public to ask general questions as well. • Strengthening Business Competitiveness: Rising input costs, especially those costs deriving from government regulation and policy, are the most common and acute concern of the business community in Alberta. • Growing Provincial Trade: Overcoming regulatory and jurisdictional barriers, and developing the infrastructure needed to move and sell Alberta’s goods is critical to expanding prosperity. • Building Healthy Communities: Depends on ensuring young Albertans develop real world skills to thrive in a future economy, access to sustainable and equitable healthcare, and well-maintained infrastructure that supports economic activity and business growth. • Improving Government Accountability: Poor implementation of government initiatives result in resource waste, disruption of the rule of law, declining investment in the province and less opportunities for citizens now and in the future. Please note there is limited seating in the Bert Church Theatre. Attendance is based on a first come, first serve basis.